HOME HYDROPONIC UNIT, 1997. The distribution system with the nozzles. 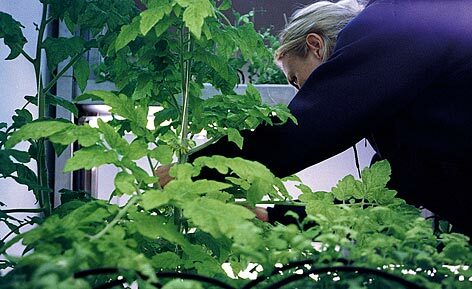 The HOME HYDROPONIC UNIT enables persons to produce their own food. It is designed for the continuous production of food in sufficient quantities to provide a daily supplement to a household of 3-4 persons. It can easily be extended. 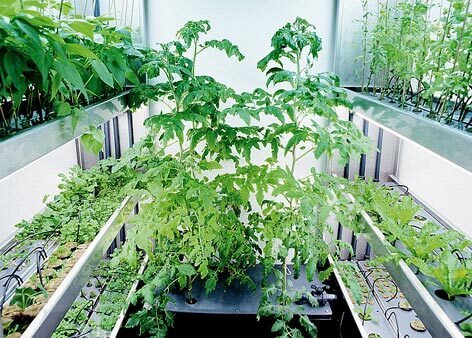 Hydroponics is a growing method that makes it possible to control and optimize all growing parameters and avoid problems like soil-born diseases. 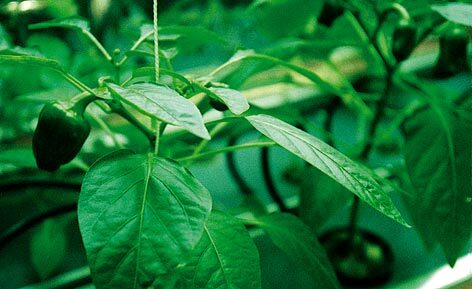 The plants are grown in pure water and the necessary nutrients are added only in the amounts needed by the plants. The nutrient solution is not discharged into the environment but re-circulated indefinitely. The biggest problem in hydroponics is that pathogens will thrive well in the nutrient solution because of the high amount of energy (organic matter/TOC), which is present in the form of root exudates. These will feed the pathogenic micro-organisms and cause outbreak of diseases. To prevent this, a hydro unit continuously cleans and sterilizes the nutrient solution. To keep the re-circulating nutrient solution optimized, the following components are used. Approximately 50% of the buffer tank volume is filled with a special rockwool biomat that acts as a substrate for aerobic bacteria. 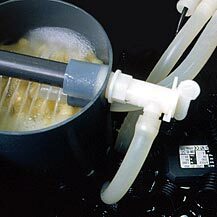 These bacteria are needed for consuming the root exudates that otherwise act as energy providers for root pathogens, especially fungus A circulation pump is connected to the tank. The solution gets divided into two flow systems. One is a shunt that leads approximately 50% of the solution back into the tank. A spray system aerates the solution and distributes it onto the rockwool biomat that acts as a bio-filter. This flow is regulated with a manual valve The other half of the solution is passed through a filter filled with activated carbon. This is for adsorption and destruction of unwanted organic matter that has not been broken down in the biomat. From here, it is led through a filter that will restrain all particulate matter down to 50 micron. After this, the solution is sterilized in the UVC unit, which disactivates up to 99% of the micro- organisms. The solution is now ready to be distributed to the growing system This distribution is done through rigid PVC and polypropylene (PEL) tubing where a number of nozzles are located. The distribution system with the nozzles leads the solution into a number of PVC gullies where the plants are situated. 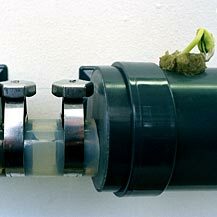 After flowing through the plant roots, the solution is returned to the buffer tank and re-circulated back through the cleaning modules and then to the growing system. The whole system is modular and can be dismantled completely for transport or storage. This means that it is easy to assemble. All tubes, fittings and connectors are made of rigid PVC and can be assembled by hand without the use of tools. The sustaining framework is made of acid resistant stainless steel (AISI 316L) and can be assembled using only a screwdriver. 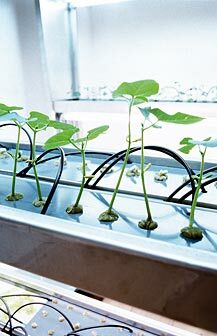 The hydroponics technique is particularly good for fragile, fast growing and water consuming plants such as lettuce, tomatoes, peppers, cucumbers, herbs, etc. Plant species and configuration of the system should be chosen according to the required amount of space and light. Large plants such as tomatoes or cucumbers may be grown directly in the reservoir, while the growing tubes are best suited for e.g. beans, lettuce and herbs. Plants with massive roots such as potatoes, beets and carrots have special requirements with regard to space and the depth and pressure resistance of the growth substrate. The HOME HYDROPONIC UNIT can be extended with growing modules to fit these requirements. Most plant species are propagated with seed, but many can with advantage be propagated using cuttings. Depending on the size of the plant at harvest time, different plant densities must be selected. Some seeds have to be stratified before germination, otherwise most seeds will germinate at room temperature in a high, relatively humid atmosphere. Most seeds will germinate both in light and darkness. Some seeds can be germinated directly in water. Other seeds only need a moist atmosphere and will perish if they get wet. A number of plants can be seeded directly into a growth substrate in their final growing position. Others have to be germinated in one growth substrate and later transplanted as seedlings into their final growing position. A number of parameters need to be controlled for the plants to grow optimally. The necessary parameters for the aerial parts of the plants, the leaves, beside light are: carbon dioxide, energy in the form of heating and some air circulation. A wind speed of 1 to 2 m/sec. is sufficient to remove the trace gasses (ethylene and oxygen) from the leaves and secure fresh carbon dioxide to the stomata. The roots need water, oxygen, and eleven different nutrients. It is necessary to control temperature, pH and conductivity of the solution. In order for the plants to grow inside a building where there is insufficient ambient light it is necessary to add artificial sunlight. This is accomplished by using two or four 36 W daylight fluorescent tubes over each shelf. The photoperiod is regulated with an automatic timer. Access to sunlight will of course reduce the need of artificial sunlight. The pH of the nutrient solution is optimal between pH 5-6. The plants will tolerate pH values ranging from pH 4 to 8, but optimal nutrient uptake is at pH 5.6. The pH will rise steadily in a normal nutrient solution without ammonium. It is necessary to adjust the raising pH with acid. The acid used for this purpose is nitric acid. Indicator strips (pH 5-7) can be used to measure the pH level. The concentration of the nutrients is another important factor to control. It should be between 1.2 and 2 mS. The concentration regulates the osmotic pressure in the plant. It can only be measured with a conductivity meter. N - Nitrogen 150 ppm, P - Phosphorus 40 ppm, K - Potassium 275 ppm, Ca - Calcium 175 ppm, Mg - Magnesium 30 ppm, Fe - Iron .55 ppm, Cu - Copper .03 ppm, Zn - Zinc .25 ppm, B - Boron .30 ppm, Mn - Manganese .05 ppm, Mo - Molybdenum .05 ppm. This recipe is a standard formulation for tomatoes but can be used for nearly all plants in hydroponics. It must be recognized that different plant species grown as monocultures will require different formulations. The air temperature may go down to 16°-17 °C at night when there is no light. It should be approx. 22-25 °C during the day. The temperature of the nutrient solution should be slightly higher than that of the air in order to avoid reverse osmosis. The water used to mix the nutrient solution will also have an influence on the quality of the nutrient solution, but normally only calcium is present in excess. Most of the salad vegetables and herbs can be harvested continuously. Fruit bearing plants will have to be harvested when the fruit is ripe. In some cases, for example with radishes, new seeds must be started two or three times a week in order to have a constant supply of edible produce. pH control and regulation with 10% nitric acid as needed, one to two times a week Conductivity control and regulation with concentrated nutrient solution to desired conductivity (1.2-2.0 mS) one to two times a week. Exchange of nutrient solution every one to three months Add pure water to the system if no automatic water control is fitted The filter cartridge in the particulate filter must be exchanged when the pressure gets too high The UVC filter must be exchanged once every year and the quartz tube in which it is mounted must be cleaned of particles and algae If the biological filter clogs up with sludge it must be exchanged or removed for cleaning The activated carbon filter needs to be checked every 6 months and new carbon must be added if needed. The fluorescent tubes must be changed when the light level gets low. They normally have a useful life of two years. The hydro system will be able to support up to 50 m of gullies using NFT (nutrient film technique) raised level (5 mm) hydroponics technique. This corresponds to approx. 50 tomato plants, 240 lettuce plants or 180 pots of herbs. Electricity consumption: pump 115 W, UVC 55 W = 170 W total. Artificial sunlight: 12 x 36 W = 432 W.
Water consumption: approx. 8-10 l/day Water volume: approx. 100 l.
Dimensions: 1880 x 1320 mm, required floor space: 3 m2. 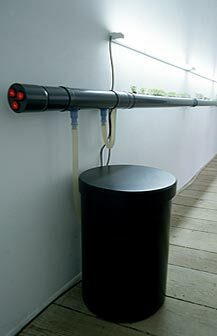 The MODULAR HYDROPONIC UNIT is a modified version of the HOME HYDROPONIC UNIT. This system is a low-pressure system, which uses only flexible hoses for fittings, water delivery and drain, and thus the risks of breakages, leaks and overflows are minimised. The cost of making and running the system is low, and it is easy to change its configuration. The plants grow in a growing substrate placed in holes in the growing tubes The level of the nutrient solution inside the tubes is approximately 30 mm, which means the roots are almost completely submerged in water. This deep-flow technique demands that the nutrient solution is thoroughly oxidized; if not, the roots will drown The nutrient solution should be kept re-circulating both day and night in order to oxidise and sterilize the solution The nutrient solution is kept in the reservoir with the pump and the bacterial filter. The distribution of the solution is carried via flexible silicone hoses The nutrient solution passes from the reservoir through the pump and is then divided into two flow systems. 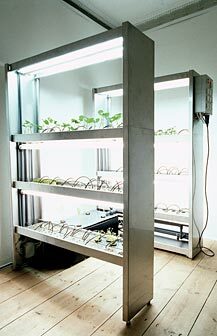 MODULAR HYDROPONIC UNIT, 1998. The growing tubes may be mounted on top of each other, next to each other on a flat horizontal surface, in a corner, or in a line. One leads approx. 50% of the solution back into the reservoir through a spray unit, whereby oxygen by diffusion is dissolved in the solution At the same time, the spray unit distributes the oxidised nutrient solution on the bacterial filter, thus ensuring good living conditions for aerobic bacteria. These bacteria consume the root exudates from the plants, which otherwise would have provided energy for pathogenic micro-organisms.